A COOLOOLA Cove worker's week has started in terrifying fashion with a runaway car coming dangerously close to ploughing through the front of her shop this morning. Gone Bonkers staff member Kylie Bryant was serving a customer just before 9.30am when the sound of a car engine caught her attention. "You could just hear the motor revving really loudly," she said. Looking up, she was greeted by the sight of a car hurtling down the shopping centre footpath and careening towards her. 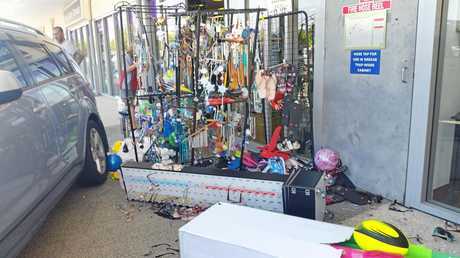 Ms Bryant and the customer bolted for the back of the store fearing a tonne of runaway metal was about smash through the window. "I thought it was going to come and hit the counter," she said. "I was right beside the door. 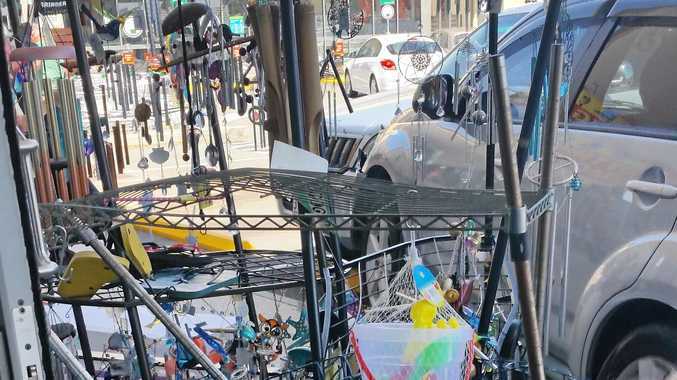 Luckily, the car instead accelerated down the sidewalk, clipping the shop window and a downpipe before collecting the shop's wind chime, glasses and balls stands and then finally coming to a halt when it collided with two parked vehicles. A woman in her 60s was treated by paramedics at the scene. She declined transport to hospital. Ms Bryant was left shaken by the extremely close call. "I think it scratched the glass," she said. While one scare would be enough for a lifetime for anyone, remarkably this was not the first close call of this kind at the shop. "It did happen a couple of years ago, too," she said. That time she was not at work, thankfully. And this time, she hopes, is the last. "Maybe they do need bollards," she said.